Last night, my son and I were privileged enough to represent Lady and The Blog at the screening of OZ The Great and Powerful. This Disney movie was directed by the wondrous Sam Raimi and stars the likes of James Franco, Mila Kunis, Rachel Weisz, Zach Braff and Michelle Williams. With all of that star power, you’d have to guess that this film would be spectacular. It was that, and more. Based on characters created by L. Frank Baum, Oz The Great and Powerful takes us back to the love we felt the first time we experienced The Wizard of Oz. It’s set in the same Oz we viewed during Dorothy’s journey, filled with Winkie Soldiers, Witches, flying monkeys, The Emerald City and that famous yellow brick road. The costumes and effects were spellbinding and the transition from the classic black and white to Technicolor takes your breath away. The 3D effects were very convincing, frightening my son just a bit during the Wizard’s trek through the Dark Forrest. So, if you’re taking the kids, be prepared to cover some eyes during that part. Bringing you into a world you’ve never seen is what Disney does best, and they have outdone themselves with this film. It’s a family-friendly movie full of excitement, humor, and heart-felt life lessons. 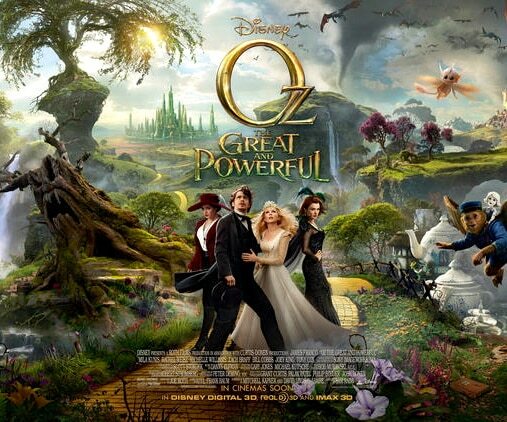 Oz The Great and Powerful will be released worldwide on Friday, March 8th. I can’t wait to take my son to see this movie! Thanks for sharing your opinion of this movie. My entire family likes the Wizard of Oz story and we watch The Wiz at least twice a month. It will be fun to see this new take on the story. I’m not so sure about that James Franco. He is good looking, but his acting…meh. I’m definitely going to pass this on to my nephews who are mini movie buffs! If they listen maybe auntie Heather will treat them to a show! Glad you had a good time. I know from the original Wizard of Oz some scenes freaked me out as a kid, so I can only imagine in 3D IMAX. I’m sure my guys would like it though. I’ve read so many good reviews. As someone who grew up on the original Wizard of Oz and The Wiz, it’ll be interesting to see this new spin on it.